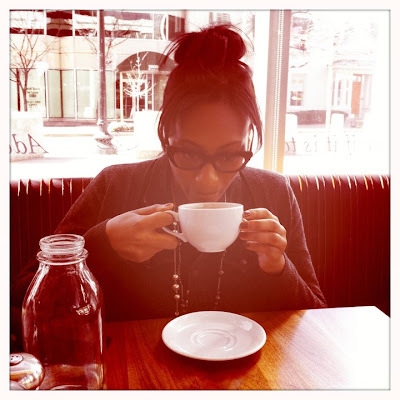 Lauren Loves to Eat: Brunch at Founding Farmers, DC! Brunch at Founding Farmers, DC! Thanks to Presidents' Day, we recently enjoyed a nice long weekend. I decided it was finally time to get out of NYC for a bit, so I planned a short weekend trip to Washington DC to visit my college roommate. It was such a fun weekend. Perhaps a little too fun...It took me 3 days to fully recuperate from the exhaustion of the trip. Anyway, I had a few great meals that I want to share. The first was at Founding Farmers, which my dear friend recommended to me. When I made the reservation on OpenTable 6 days in advance, some of the brunch slots were already booked. Luckily, we still managed to get a 12:45pm reservation. But it's nice and bright inside. Beignets! I really should watch my sugar intake, but I'll worry about that some other day. These beignets came with raspberry, chocolate, and caramel sauces on the side. The beignets were so fluffy and airy. The Founding Farmers Breakfast. For $3, my friend upgraded from sausage to thick cut bacon. The bacon was really tender. 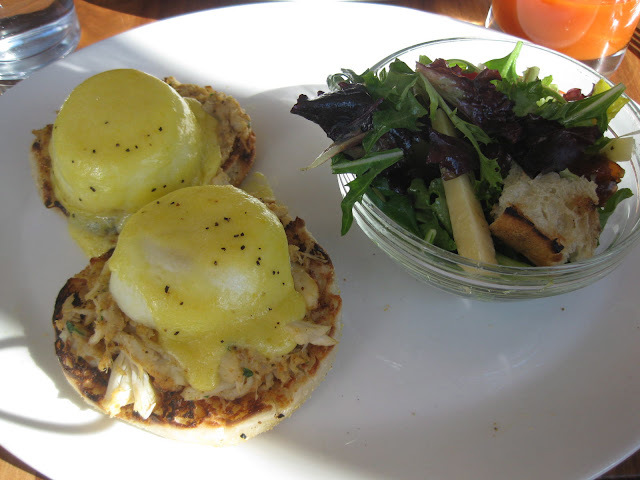 I got eggs benedict with crab. The english muffin is made in-house and apparently the crab is from Chesapeake Bay. Probably one of the best eggs benedicts I've ever had. And the price was pretty unbeatable-- $14! That's usually how much an order of eggs benedict with ham costs in New York. The sides you could choose from were Hash Browns, Grits, Farmer's Salad, Fresh Fruit, or Tomatoes. I got the salad which came with champagne vinaigrette dressing and dates. It was so pretty I took another picture. Our server was nice, but really inattentive. He came to check on us once-- after we were all done eating. My friend wanted more jam for her toast and didn't get that until she'd finished eating everything else on her plate. It took forever to get our bill and even longer for it to be collected. I was ready to stand up and hand it to any server/busboy walking by.